Our core belief is to only deliver laser toners that are the very best quality that are made to function properly within your printer. You aren't only sure of high quality cartridges, but you'll also get them delivered and for free. Right here at Cartridge Save we are not willing to concede on customer care as well as the high quality of our HP toners. It's takes no effort to save cash here at Cartridge Save due to the 100% free next working delivery. We are pretty dedicated to efficient delivery, with 98% of purchases arriving on the next day. So we can provide you with greater security, any HP LaserJet 4000T toner purchased from us incorporates a comprehensive thirty day money back policy. Find the best cartridges and spend less only on Cartridge Save. Built for larger workgroups, the HP LaserJet 4000T printer is typically the same machine as the base model, LaserJet 4000. However, the LaserJet 4000T is more suitable for high-volume print work as it boasts additional paper capacity. Instead of having only 2 paper trays, the HP LaserJet 4000T printer has 3, which increases the paper capacity by 250 sheets. This printer is a basic monochrome laser device with a small internal memory, easy paper handling options, and standard connective options. Network capabilities are only available with the high-end N and TN models. The HP LaserJet 4000T may appear bulkier than other laser printers. The additional paper bin adds height. It has a small LCD display on the top panel, below which are several control buttons which can be used to start, restart, or cancel print jobs, and access other printer settings. The HP LaserJet 4000T comes in a greyish finish. With a monthly duty cycle of up to 65,000 pages, the HP LaserJet 4000T laser printer makes an excellent choice for heavy volume printing. It is not too expensive to maintain either, especially with its high yield LaserJet 4000T toner cartridges. Print speeds are respectable, although there are faster models and print quality is actually superb at 1200x1200 dpi. 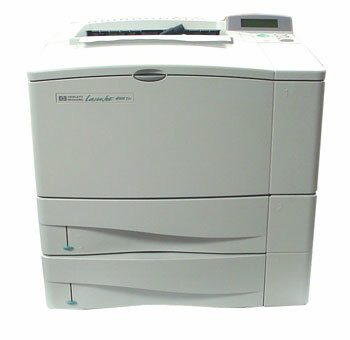 Additionally, the HP 4000T laser printer is one of the cheapest in its range, considering its high volume capabilities. The HP LaserJet 4000T is only limited to monochrome printing and can only be used with single computers, unless users choose to upgrade to the N and TN models.